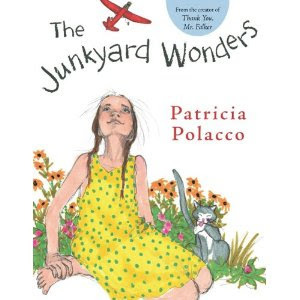 Story time tonight we read The Junkyard Wonders by Patricia Polacco. I am always amazed at the stories Polacco has to tell. She had difficulties during her childhood and she shares these stories through her books so others, young and old, can, I don't know, feel represented out there in the big world. Each time I read some of her titles I get teary. Betty Doll did it to me. Thank You, Mr. Falker did it to me. Pink and Say did it to me. Add The Junkyard Wonders to the list-Books that make me cry. Polacco tells the story of the year she stayed in Michigan for school and was placed in the junk class of misfits. Mrs. Peterson, her new teacher, is one of those amazing individuals who see her students as unique and worthwhile.The class bonds and work together to create some special hands-on projects. Mrs. Peterson's brilliant teaching is reason enough to read the book but there's more. If you haven't checked out Patricia Polacco's latest book I highly recommend it to all. What books are on your tear up list? GTC reviews it at Books For Kids. While I haven't had a chance to download my Halloween photos I did make this over the weekend...Watch my Skater Girl video-she is learning to spin! I should have added music-I'm a novice-and the best moment is at the end. She is awfully cute. Tomorrow stop back to read about Buying Time by Pamela Samuels Young.